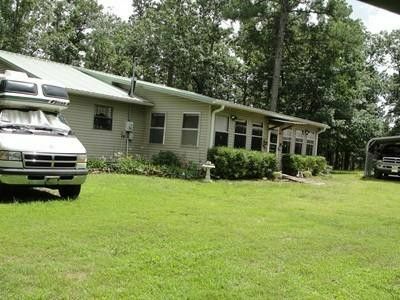 These beautiful 5 acres are secluded & border the Ozark National Forest. The land has many walking trails, and a four wheeler trail that will end in Catalpa. There is a outbuilding, all have electric and a large barn. The home also features 3 bedrooms, 2 bathrooms, a spacious kitchen with lots of cabinetry space,2 enclosed sun rooms, and a covered porch. Vinyl plank flooring and and all doors are 36'' handicap doors. Land also has an extra septic and water meter perfect for another home. Property has a well but also has city water. Agent owned.